Andrew Lownie Literary Agency :: Book :: Happy Mealtimes - for Kids: Quick and simple meals that children love. 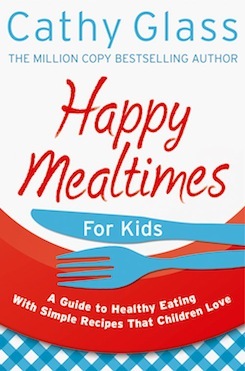 Happy Mealtimes - for Kids: Quick and simple meals that children love. For over 25 years Cathy has been cooking meals - not only for her own children but for the children she fosters, many of whom arrived with the most appalling diets. Like most parents she is also very busy and has become adept at providing simple, quick, economical and wholesome meals that appeal to all children. In this book she shares successful recipes – loved by children of all ages (and adults), together with useful information on food, and tips for ensuring children eat healthily. Happy Mealtimes – For Kids is the essential no-nonsense cookbook for busy parents.
" Number 1 best-selling author, Cathy Glass, shares her experience and expertise gained across 25 years as a foster carer in this accessible and practical guide to establishing healthy and happy mealtimes...From how to establish routines to what to feed your children for breakfast, lunch and dinner, the importance of mealtimes for family bonding to the impact of the recent UK legislation governing school dinners, Cathy has compiled a comprehensive yet accessible guide to all you need to know about producing healthy and happy family mealtimes." "This is the third in the series of Cathy's Happy books, and as with Happy Kids and Happy Adults there is a lot of useful information and practical ideas. Cathy's style of writing is easy to understand and her recipes are easy to follow. Very reasonably priced too. I shall be recommending it to my friends, family and work colleagues." "Another excellent book in the "Happy" series. Easy to follow recipes for healthy, nourishing meals suitable not just for children but for the elderly too! Like all Cathy's books the clear writing style makes them a joy to read and I shall certainly be recommending this book to friends and colleagues." "Easy to prepare, healthy meals for kids. The recipes are straightforward to produce using easily obtainable ingredients. Although the book was written with kids in mind, I find that the recipes are great for adults too."